Almotamar.net - Civil establishments, civil society organisations and professional federations and unions in Yemen have Thursday received with big support and welcome the decision taken on Wednesday by the National Defence Council concerning the election of governors and heads of districts in Yemen. Lawyer Mohammed Ali Allaw, the general coordinator of civil society establishments coalition announced the welcome of the courageous decision taken by the National Defence Council. In a statement almotamar.net obtained a copy of it Allaw expressed the support for the constitutional amendments concerning the decision. The coalition that includes around one hundred civil organisations asked the parliament for speeding up approval of the amendments in order to carry out in accordance with the constitution, considering the decision as a new addition to the democratic achievement of President Ali Abdullah Saleh. 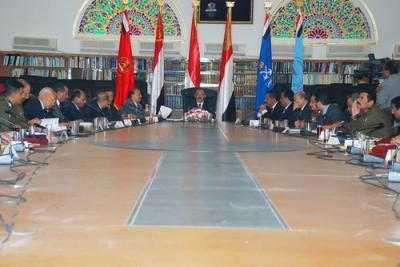 Meanwhile, the General Federation of Trade Unions of Yemen and all of its members and leaderships of general unions and the federation's branches all over Yemen considered the decision as a forward democratic step in harmony with the democratic and development evolution and as enhancing the genuine democratic practice in Yemen. The Federation valued the national decision that represents the foundation for realisation of progress and achievement of goals of development and prosperity of the society. In the same context the Yemeni society for peddlers and markets received this courageous decision on election of governors and heads of districts by local council with great pleasure. The society considered the decision as a qualitative transfer in the field of stabilizing the democratic approach on the ground and enhancing the democratic practice in word and action. The society said in a statement the decision indicates the strong will and genuine commitment to going ahead in consolidating the democratic pursuit and the transfer to the local rule system and expanding the base of the people's participation. Yemen Women Union, Aden branch said the decision would contribute to prepare suitable atmospheres and secure climates for accelerating the process of construction and development in all fields and would contribute to enhance security and stability all over the country. On its part the executive bureau of the agricultural cooperative union and all farmers in Yemen affirmed their support for the decision on governors election, and confirmed in a message addressed to the President their stand by implementing this courageous and wise decision. In a similar telegram the General Union of Yemen Youth expressed its welcome and blessing of the decision aimed at enhancing partnership of the local society in consolidation of the state of institutions system and decentralized changes in administration and boosting the concepts of local authority, considering the decision as a pioneering step and wise pursuit for the people's participation in the government. The Madar Legal Foundation for Training and Qualification welcomed the courageous decision concerning election of governors and heads of districts by the local councils. It has considered the decision as a democratic achievement and a big transfer for the Yemeni people. The Oil, Minerals and Chemicals Trade Union blessed the decision taken by the National Defence Council on the constitutional amendments concerning election of governors. It considered it as embodiment of the large people's participation in the local rule and enhancement of the democratic process. The Yemeni Physicians Union said this wise decision would have positive result in activating democracy and moving to the direct local rule, confirming its support for the decision.